Welcome to the Daily Starter, your daily Kickstarter nugget of information, highlighting projects we deem worthy of your time, attention, and support! 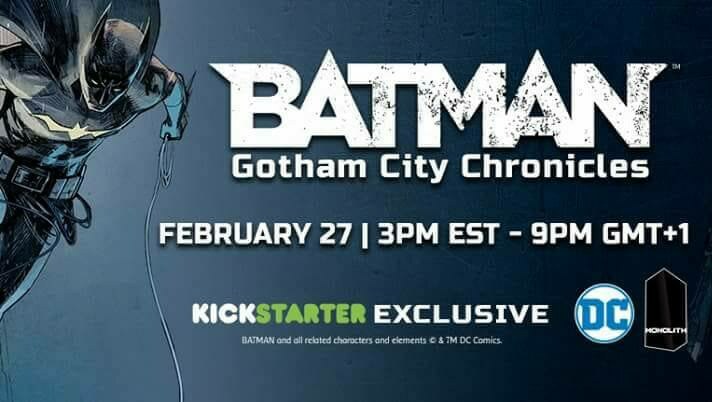 Today’s Starter, Batman: Gotham City Chronicles! That’s right, come the end of winter, through hell or high sewage spills, DC takes another plunge for our tabletops, in the form of this asymmetric 1-vs-Many miniatures boardgame from the minds behind Conan, this time exclusively for Kickstarter! Gotham City Chronicles will be based on and around the same system that drives the aforementioned Conan boardgame by Monolith, that is to say it has a group of players controlling 1 character each take on the villain who will take control of various groups of thugs, minions, and masterminds of the Batmanverse in an attempt to thwart the heroes’ plans and bring about one manner of doom and gloom or another. Wade your way through waves of Joker’s minions while controlling Batman, Nightwing, Batgirl, or Robin and live out your heroic fantasies or take over the villains and wreak havoc with Clayface, Scarecrow, Riddler, and all manner of other bad guys and gals on your way to crush the hero gallery’s hopes and dreams unto their unavoidable damnation!!! Ahem… We may be getting carried away here slightly… But with promotional material like this who wouldn’t? The mechanisms behind the game are based around energy cubes that act as both the heroes’ and villains’ action points, that are spent each turn and are recovered in certain amounts at the beginning of each subsequent one. Spending these allow miniatures to move, act, employ special abilities or gadgets, all mostly done via the rolling of dice showing varying degrees of successes on them. Carefully negotiating the use of the energy cubes for both attacking and defending gave Conan a very interesting resource-management-miniature-game feel that no other experience comes close to, in our book - at least until GCC, that is. What it gives us are zones of varying sizes, with a symbol in the middle, in which miniatures are placed. The type of symbol tells you what elevation level the zone is a part of, and drawing a straight line from one symbol to another lets you see if a mini has a clear/obstructed line of sight to their target. This makes for quick assessment of situations, easy to calculate movement, and simple ranged combat, which in turn makes turns fast, furious, and dice-chuckingly awesome. The Hero Boards give players easy access to all the information needed to play their respective hero to its fullest: from characteristics to skills and other relevant data in between, these all vary on a case by case basis and are as varied as the personalities they represent. It is this underlying system that GCC itself will go with, with a few modifications and gadgets on top to take it from Sword & Sorcery and into Cowl & Batarang territory, all the while boasting a varied panoply of Batman heroes and villains (and with Monolith’ previous runs in Conan and Mythic Battles we’re expecting hundreds of miniatures, including variants for the main characters - hello, Robins!) for an estimated price tag of $130 for the main box (which contains everything you need to play), and a rather reasonable (in the circumstances) $300 for the all-in pledge, presumably adding on modules, expansions, and single miniatures. The Monolith Facebook Page and Batman Gaming Group as well as the Monolith Youtube channel have begun churning out info on the game since announcing its Kickstarter launch date not long ago. The game has been in production for a while, and we’ve got first-hand videos from the likes of Barry Doublet (a review channel everybody should follow) and BeastsofWar to get a feel for what the final game will look/feel like. Concurrently, there are various how-to-paint videos available for some of the miniatures, as well as the painted examples we’ve linked here and many others to ogle at and drool over. There is also a forum that branches out from the main Conan one where all future custom content/various information will be featured, so keep a close eye on that! We highly encourage you to check what all the fuss is all about and return for more info as it becomes available… Like this brand new set of Batmobile pics they uploaded!